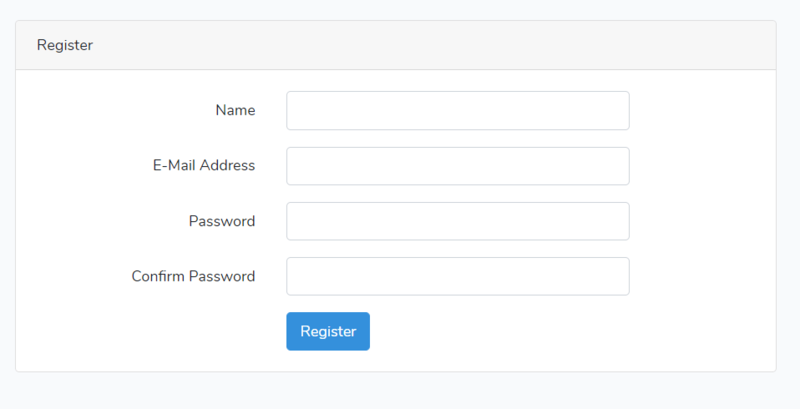 Laravel provides built-in user registration and login system. Most of the developers are not aware of this built-in system (We also didn’t know this feature). When we come to know about this feature, we got surprised. It saves us a lot of time from building a login and registration system starting from scratch. In this article, we study user registration and login system in Laravel – the feature provided by Laravel itself. Here ‘laravel-dev’ is the name of your Laravel project. Of course, you can change the name as you wish. This command will create authentication controllers like LoginController.php, RegisterController.php, etc which you will find the app/Http/Controllers/Auth directory. It also creates a views login.blade.php, register.blade.php under resources/view/auth directory. This make:auth command also creates a app.blade.php file under resources/views/layouts directory. This view is a base layout for your application. It uses Bootstrap CSS framework but user can customize it and change the design. While building a registration system, normally on signup we send an activation link to users. This activation link will use to verify the user account. Once, the user clicks on an activation link then we make that user active for our system. In other words, after verifying account user can browse the pages to our system. 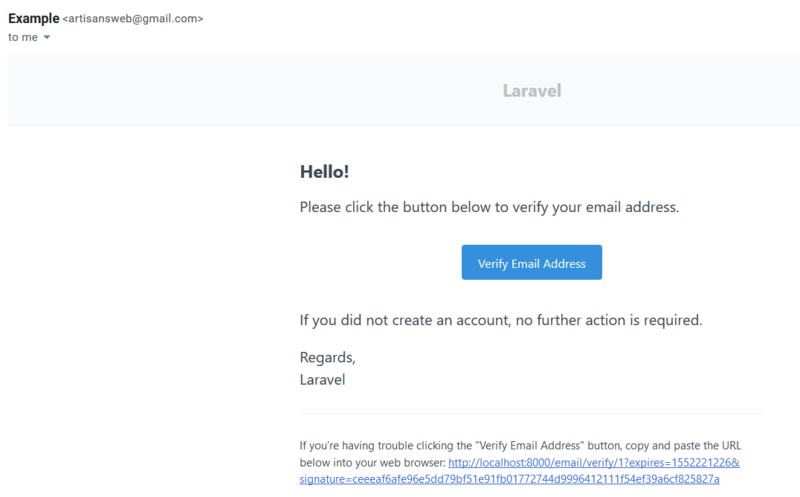 Laravel provides a built-in system for email verification of a newly registered user. Using this, on registration user will get an email with activation link. Once he activated account then he would able to browse the system. Here, we can apply middleware('verified') for protecting routes. Doing so, these protected routes can be accessible only by verified accounts. Open the App\User.php file and make sure this model implements Illuminate\Contracts\Auth\MustVerifyEmail contract. How does it work? If you check the migration file, user table must contain email_verified_at column. This column will use to verify whether the user activated their account. If activated, then this column will store date and time at the time of activation. When we run the make:auth command, it also creates a Auth\VerificationController class which has logic written to send verification links and verify emails. To register the necessary routes for this controller, write the below routes in the routes/web.php file. You will have control of where to redirect the user after verification. If you open the Auth\VerificationController file you will find the variable $redirectTo which will use for redirection. Change this route as per your requirement. At this stage, we are ready to test the user login and registration system. For this to work, your application should able to send emails. You can use the Gmail SMTP server to send emails. For more details, please read our article Sending Email Via Gmail SMTP Server In Laravel. Please note, Laravel allows us to login to our account even if we did not verify account yet. But we can’t access protected route. Remember we have added middleware for one of our route profile. Now without verifying your account if you try to visit the http://localhost:8000/profile, it will redirect to the http://localhost:8000/email/verify URL. Go ahead and verify your account. You will see email_verified_at column in the users table has DateTime added. It means you have verified your account successfully. Now you should able to access even protected routes. We hope you understand how to use user registration And login system in Laravel. You may also like to read our article Social Login System Using Laravel Socialite.